I am determined to get in some strength and core workouts while we are still on the boat.... as you can imagine, my space is somewhat limited. But, I just don't like packing up a gear bag and driving to the gym. So, I have put together a shortish routine that I can do for my upper body with my 8 lb. dumbbells. It consists of 6 different exercises for my upper body and I think it hits the muscles I want to work, fairly evenly. I do 10 reps of each, and then I repeat it another time, sometimes twice. I wish I had room for pushups but it is a tight squeeze so I am leaving them out for now. I actually love pushups. They make me feel like I am really working hard! Along with the lower body work, I am doing some Pilates moves. I was going to get out my Pilates for Dummies DVD and do it a couple of times a week, but we seem to have a tv conflict! And I don't like to play DVDs on my laptop. This DVD comes with 2 workouts... a beginner and an intermediate. It gives me a pretty good core workout. I do like doing Pilates and love the way it makes me feel like I have stretched myself an inch or two taller, after I am done. I also think that Pilates is beneficial because I am a runner. Once we are moved into the house for the rest of the Winter and Spring, I will definitely be doing the full mat a couple of times a week. "Running is a high impact activity that puts great stress on the lower back and lower joints. Any imbalance in the muscular usage of the legs and hips can cause pain and injury to a runner, especially the knee and hip. Runners tend to be quite strong in their calf muscles, quadriceps and hip flexors, with tight IT Bands as a result of the impact. Pilates helps to balance things out in the legs by strengthening the hamstrings, inner thighs, and glutes to take pressure off the front and side of the leg, leading to better alignment and less chance of injury. Plus the pelvic, ab, and back strengthening help to maintain better stability and alignment through the entire body while running." Have you ever done Pilates? Are you a fan? Do you think a short strength routine is better than none at all? Do you strength train regularly? What does your routine look like? 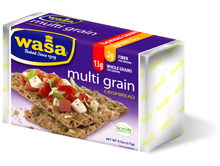 Wasa will send 5 packages of their Crispbreads and Flatbreads to one lucky winner. If you like healthy snacks, please go have a look. I would love it! very interesting! i have never tried pilates...mostly because i do not know a lot about it. i think after this race in 2 weeks...i want to take some time to try out some new types of workouts :) hope you have a good weekend! I did Pilates for a while in college. It is a GREAT workout and just makes you sweat like CRAZY. And I agree... pushups are the REAL workout! wow - very impressive that you get such a good work out in such small space! I do strength training, but mostly just follow DVD's at home (Jillian Michaels, etc). I've never done Pilates, but I've heard very good things - especially for balancing out the tight hips, etc that runners usually experience. Oh gosh, working out on a boat, that is a new one for me! That must be a challenge! Can you do pushups on deck? i enjoy pilates but I like those high intensity, scream and feel the burn workouts and from the pilates I've taken, it's a milder approach while still getting a killer workout! I love pilates. I know all of the benefits to runners but for some reason it is never high on the cross training priority list. Good luck with your new plan. I haven't tried it, but I've heard really good things about it - especially Pilates classes if they are taught well. Loove pilates and so does my husband and his mom! Great to do in the summer when it's really hot or the winter when it's really cold!